The town rode the company’s postwar boom to financial wealth and today the two are inseparable. There’s a top league soccer club that wears the VW logo and plays in the Volkswagen arena; Volkswagen’s headquarters and manufacturing plant take up much of its real estate. There’s a Volkswagen bank, a Volkswagen real estate dealer, and even a Volkswagen sausage factory. “People are feeling a little down, like heads will roll, and not up high but at the lower levels,” said 65-year-old Mark Graff, waiting outside the VW gates to pick up his daughter after her shift on the assembly line. “First will be the part-time workers, and there are a lot of them,” he said. Nobody knows quite what to expect, but nobody thinks the coming months are going to be easy as the world’s top-selling car manufacturer struggles to deal with myriad legal and technical problems while trying to restore its image. The city is already freezing spending and hiring. With the use of foreign forced laborers, prisoners of war and concentration camp prisoners, the Volkswagen factory was quickly built. Instead of the People’s Car — what became the VW Beetle — it produced military jeep-type vehicles, V1 rockets and other military equipment. Renamed Wolfsburg in 1945 after a nearby castle, today the town of 120,000 people has 120,000 jobs, drawing commuters from the surrounding area. Some 70,000 work for Volkswagen, while many others depend upon the company. 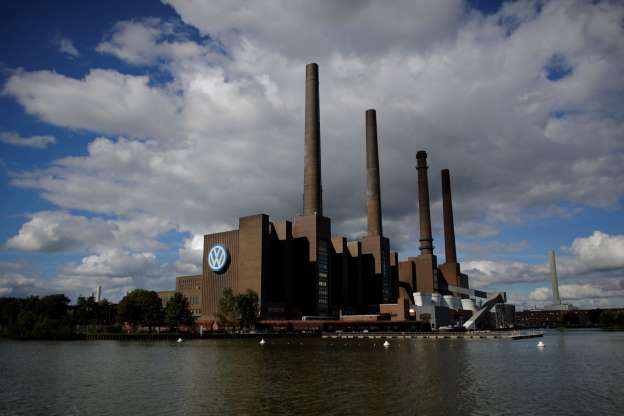 Wolfsburg is as dependent on the auto sector as Detroit was in its heyday. Sumon Ahmed, a 24-year-old who was working at the Volkswagen plant for the summer, said he’d heard people saying they might not get a bonus — a hefty 5,900 euros ($6,610) per employee covered by the union contract last year. “At least there will be a short-term effect with a decrease in profits, but in the long term we just don’t know,” he said, still wearing his blue VW shirt as he started his afternoon trek home after his shift on the line helping build the Golf and Polo models this week. Most others coming off work refused to talk about the situation, circling the wagons — or Volkswagens, as it were — in support of their employer. “Go to Mercedes; they also have dirty secrets,” barked one middle-aged man in a VW shirt. It’s an understandable attitude, considering that Wolfsburg — off the Berlin-Hannover highway in northern Germany — is the country’s financially strongest city thanks primarily to Volkswagen. Its economic output per person is the highest in the country. Ingolstadt, home to VW subsidiary Audi, is in fourth place. Volkswagen AG could face fines in the U.S. of as much as $18 billion for 482,000 cars identified with the so-called “defeat device” that allowed them to beat the testers. Other countries, such as South Korea, have also ordered investigations into emission levels of VW cars and some law firms in North America have filed class-action suits. Volkswagen has set aside an initial 6.5 billion euros ($7.3 billion) to cover the fallout and “win back the trust” of customers, though it didn’t mention possible fines. The trickle-down hasn’t taken long to reach Wolfsburg. “What is happening now is certainly a difficult phase, but the hope is that VW will come out of it stronger,” he said. “Once I’m done then I can imagine working for VW, but that doesn’t look so good now,” said 17-year-old student Tobias Batzdorfer, who has two years left in school.